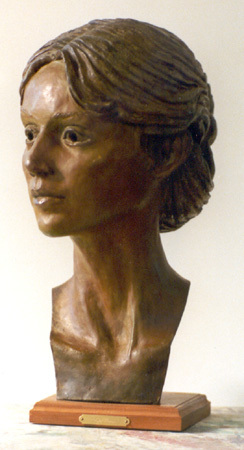 Lillian is one of the first heads I ever sculpted. Lillian Finley was (and probably still is) a beautiful dancer, who had a studio next to mine at McGuffey Art Center in Charlottesville, Virginia. I asked her to pose for me in order to capture her grace and elegance. After I cast the head in my own foundry, I ran into Ron Young (the writer of the book on how to build an art foundry) who was happy to patina it for me.